WoW 7. 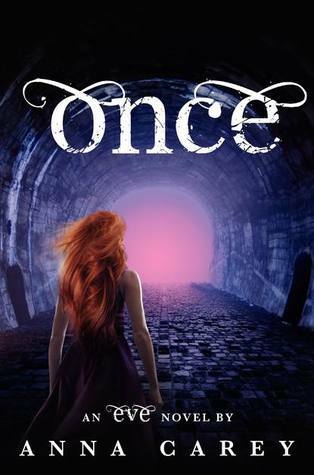 Anna Carey - Once. "Waiting On" Wednesday is a weekly event, hosted here at Breaking the spine., that spotlights upcoming releases that we're eagerly anticipating. Expected publication: July 3rd 2012. I really liked the first book 'Eve' and it ended with quite a cliff hanger. She left Caleb alone, while he was wounded, so she could flee to Califia. Before I read this summary, I didn't know if they would meet again (I expected it, but you never know.) Now, I really can't wait to find out what the real reason for her capture is. It sounds great to me. I have Eve here on audio, I guess I should start listening to it if it's so good you're featuring the sequel in your WoW ;) The cover reminds me a bit of the cover for Until I Die by Amy Plum. Might just be the choice of colors though. I hear a lot of people talking about audio. I never tried it. The fact that I can't read is holding me back, but perhaps, I should give it a try sometime. Eve is really worth your time ^^ Have fun if you start reading it! Ohhhh, I'm a bit jealous right now :p But this comment makes me wanna read it even more! Thanks! :) I'm going to take a look at your pick! Oooh, I hadn't heard of this series. Sounds interesting. I'll have to check it out. Great choice! I need to read Eve soon I have heard so many great things about it. Hopefully I can read it before Once comes out. I hope that you manage to read it on time! :) Thanks for stopping by. I'm really looking forward to this one as well!! The cliffhanger was horribly awesome, and that's why I can't wait for the next one. Great pick! Haha, you're right! Thanks for stopping by. I've been wanting to read Eve. I love dystopians. The covers of both books are so pretty! Thanks for visiting My WOW! If you love dystopians, this one should definitely be on your to-be-read-list! I haven't read Eve yet, but I do have it on my shelf! I've heard the sequel is way better than the first one. Fabulous pick, Mel! Well, if this one is even better.. it must be fantastic! I haven't read Eve yet, it's been on my list forever. I LOVE both of the covers for this series so far though! Great pick! Oh, this reminds me that I still need to finish Eve!! I had an ebook of it but it expired before I could finish it! I'm already looking forward to book 2, though! Excellent choice! Aww I wanna read Eve SO bad! I need to get my hands on it ASAP! Great pick, I'm sure. :D Thanks for stopping by! I still haven't read Eve. I have way too many books on my tbr! Thanks for sharing! I haven't read Eve yet but it's one I definitely want to read, I love the covers though!. Thanks fr stopping by :). I could not put this book down. Regardless of the negative things I heard from some of my friends (or other reviews) I really, really, REALLY enjoyed this book. So much that I now need to go out and buy my own copy (only downside of borrowing books). WoW 8. Juliet Marillier - Shadowfell. Review 15. Suzanne Weyn - The crimson thread. Review 14. Victoria Schwab - The near witch. Top 10 Tuesday (5) Next month. Review 13. Leigh Fallon - Carrier of the mark. Review 12. Michelle Zink - Circle of fire. Top 10 Tuesday (4). Historical fiction. WoW 5. Brian James - Life is but a dream. Top 10 Tuesday (3). Covers of 2012.